This study addressed two questions: 1) whether a relatively low dose of n-3 fatty acid ethyl esters (n-3 FAs) administered to healthy volunteers for a prolonged period of time would exert beneficial effects on plasma lipids, platelet function, and thromboxane biosynthesis; and 2) whether a short-term loading treatment (6 wk) with 6 g n-3 FAs/d followed by 12 wk with 3 g/d results in more pronounced effects. 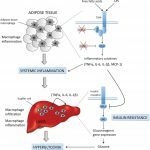 After 6 wk treatment a reduction of plasma triglyceride concentration and an accumulation of EPA and DHA in plasma were observed. A longer period of treatment with n-3 FAs was necessary to affect platelet aggregation and thromboxane A2 biosynthesis. At 12 and 18 wk, platelet aggregation, thromboxane A2 formation, and the excretion of thromboxane metabolites in urine were reduced, particularly in subjects who received 6 g n-3 FAs/d during the initial 6 wk. After treatment ended, triglyceride and thromboxane A2 biosynthesis returned to baseline values within 4 wk, whereas platelet aggregation remained impaired for > or = 14 wk. The longlasting impairment in platelet aggregation was accompanied by the retention of n-3 FAs in platelet phospholipids. Persistent changes in the fatty acid composition of erythrocyte membranes after moderate intake of n-3 polyunsaturated fatty acids: study design implications. To examine the incorporation of n-3 polyunsaturated fatty acids (PUFAs) into erythrocyte membranes during and after moderate n-3 PUFA intake, 12 healthy men were fed three diets for 6-wk periods in a 3 x 3 crossover design, supplying different amounts of eicosapentaenoic acid (EPA, 20:5n-3) and docosahexaenoic acid (DHA, 22:6n-3): a control diet, a fish diet (0.15 g EPA/d, 0.41 g DHA/d), and a fish + oil diet (5 g fish oil/d; 0.99 g EPA/d and 0.99 g DHA/d). A 6-wk washout period was allowed between diets. Between 6 and 12 wk after the fish + oil diet, erythrocyte EPA and DHA were still declining and it was only after 18 wk that erythrocyte EPA had returned to baseline whereas DHA had not. Investigators examining variables that are influenced by altered membrane fatty acid composition should be aware of these prolonged effects when designing studies. Protracted washout periods (greater than 18 wk) make the classic crossover design prohibitive and a parallel design becomes essential. Adapted from Neubronner et al. Enhanced increase of omega-3 index in response to long-term n-3 fatty acid supplementation from triacylglycerides versus ethyl esters Eur J Clin Nutr 65 (2010) 247-254. Both TG and EE forms of fish oil quickly got the participants from below an index of 8 to well above it. And it looks like it took less than 3 months to do so. 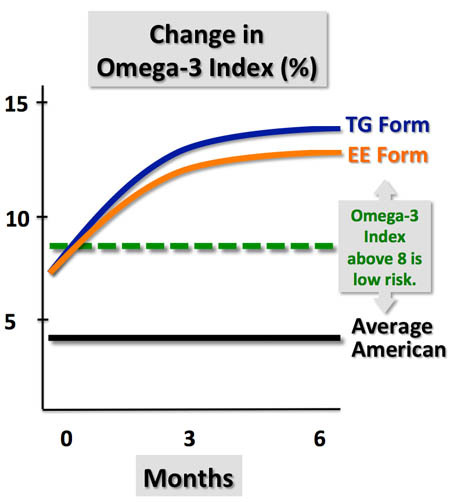 There was a 15% difference in Omega-3 index between TG and EE fish oils at the end of 6 months. This tells me that the ‘biological outcome’ (translated to English, that means ‘the benefits to your health’) is virtually the same. 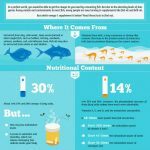 In the authors words, the EE fish oil ‘highly exceeded’ the goal of getting the participants above an Omega-3 index of 8. They reached a very healthy index of 12.2.